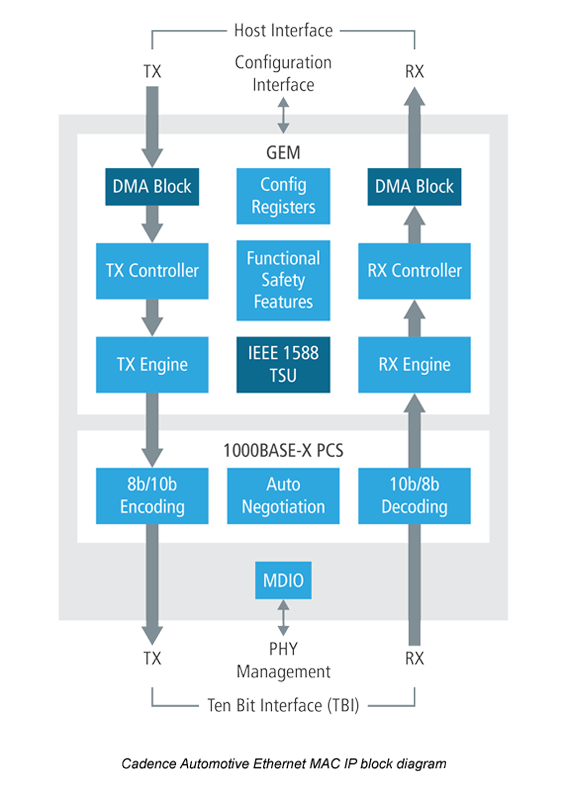 The automotive industry is trending toward Ethernet for in-vehicle networking (IVN) based on open IEEE standards. Driven by the OPEN Alliance SIG, these standards aim to develop a simpler, but more powerful, automotive electrical/electronic architecture. Cadence offers a variety of IP to support automotive Ethernet applications. The Cadence® Controller IP for Automotive Ethernet is designed as an integrated Gigabit Ethernet MAC (GEM) and 1000BASE-X PCS solution that can be smoothly integrated into any SoC. The Controller supports the datapath parity protection, and TSN/AVB features that ensure timely and reliable data transfer with low latency, required by time sensitive automotive applications. High QoS enables unified Ethernet communication of critical data without traffic congestion in shared networks. The Controller IP provides a high bandwidth, and ensures reliable and time sensitive communication within the automobile applications, including ADAS and multimedia-rich Infotainment systems. The Automotive Ethernet MAC IP can be combined with other IP or devices using standard interfaces. The accompanying physical coding sublayer (PCS) and connectivity IP let the user to interface Cadence MAC and third-party IP.